We had a 12-mile run scheduled yesterday. We covered the distance. I am sun-burned and sore and wishing I had worn adequate sun coverage. Seriously, I need to get a Monday to Friday* visor. Miles 5-6: The headwind after turning (South? East? It’s all the same out in Flatland) and all the traffic on this road is terrible. Thank goodness we had to stop for a freight train so I could get a rest. Miles 6-8: Hey, doesn’t your friend live on this road? Maybe we should go say hi. We did stop and he gave us more water and let us be in his air conditioned house, which was AWESOME. Miles 8-10: Did it get about 15 degrees hotter while we were in his house…and sunnier? Miles 10-12: You know, I am totally okay with our walking these last two miles because I think I might pass out. By this point I was wishing for some UV coverage. And upon completing our 12th mile in 2 hours and 34 minutes, not counting the break, we called my in-laws to pick us up about a 1/2 mile from their house. Father-in-law rolls up in his truck quipping, “Ha, couldn’t make it up heartbreak hill, huh?” No, no we couldn’t. But you know what — our time even with the walking was not that much slower than my first 5K a couple of years ago. So, maybe I do have a marathon in me in the next couple of years. * “Monday to Friday” is a euphemism. Because we keep a clean blog here, right? Updates for Fermentation Friday. First, we’re going to try to brew a Porter this weekend in addition to going to a wedding back in Josh’s hometown. Not sure it’s going to happen, but I’ll let you know how it works out. The owner seemed a little more knowledgeable than his second-in-command, who described two beers to me as sours that were not, in fact, sour beers. Overall, not a regular stop since it’s out of the way for us, but a nice addition to the Columbus beer scene. They were doing a brisk business when we went last Saturday. Also, skipped weigh-in Wednesday, so…181.9 lbs this morning. Assuming I don’t gain 3 lbs of water weight this weekend (and that’s a big assumption) this may be the start of a downward trend. I made cashew milk for the first time last night. It’s tasty, but having the patience to let the cashews soak overnight beforehand was tough for me. Funny that something so easy tests my patience because I have to let it sit. 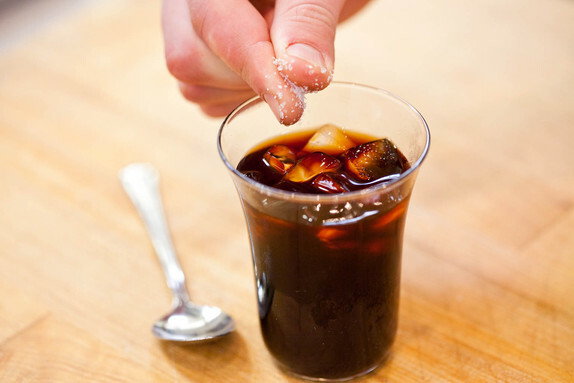 America’s Test Kitchen had a cold brew coffee recipe I might try. A twist at the end: adding kosher salt! Yes, that’s salt he’s adding. Weigh-In: 185.8 this morning. I was 183.5 two days ago. Looking at the trend lines from my scale, over the past month and a half I’ve crept up from “around 184” to “around 185” with about 2 pounds of water weight related variance in either direction. I’ve stopped tracking my food over the summer and I’ve upped my intake of beer. Both of these things are mistakes, I think. Time to get back on the bandwagon. Non-Scale Victory: On the other hand, I’ve run 20 miles in the past 5 days — two 5-milers and one 10-miler — so despite what the scale says, I still consider my overall health to be good. Posted in Non Scale Victory, Wednesday Weigh-in. Josh got tickets to have our beer canned by Buckeye Canning at the Grandview Summer Session festival in August. Not sure yet what we’ll brew or whether we’ll bring our dog, but this should be a fun event. I wonder if we get to design art for the outside, or if they’ll just be plain aluminum cans. Probably the latter, but maybe there’s a way to add some cool labels afterward? P.S. Today’s weigh-in 184.4 lbs. Still stuck in the mid-180s. I’m considering using this as an ice breaker for a business accounting unit I’d like to teach for my class next Spring. Apparently you have to click through since it won’t let me link to the picture of the comic.